UJV-160 prints not only on roll media but also on rigid media. 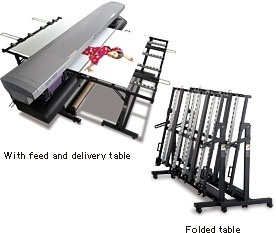 Equipped with a feed and delivery table, it enables direct printing on rigid media up to 10 mm thickness and 12 kg. Compactly designed, the table can be folded when not needed thus allowing for a smooth changeover between roll and rigid media. *Print accuracy may vary depending on types and coating of media. Please test the media beforehand. Car wrapping, Banner (Tyvek®), Banner (Transparent PET film), Backlit film (PET film), Printing with white ink on transparent PET film. The new UV LED curing technology does not emit infrared rays thus enabling print on heat sensitive materials. UV LED curing with UV inks means instantaneous drying that eliminates post-printing drying time. This innovation leads to dramatic reduction of job turnaround time (from printing to processing) and increase in productivity. UV LEDs have a longer lifetime and save about 50 % in energy in comparison with conventional UV printers employing halide lamps. Another environmental friendly aspect of UV LED technology is the fact that it does not emit short wave ultraviolet rays which generate ozone. LH-100 excels in scratch and chemical resistance as well as color reproduction. ●Prints on aluminum composite board, styrene board, and pasteboard. Gradation reproducibility is improvedwith light color inks.Ink flexibility gives the printed media bendability. LF-200 has 200 % elasticity, suitable for embossing and other post-processing tasks. ●Car wrapping, package, and banner using PVC. ※1 As ink flexibility of LF-200 ink and stretchability of LF-140 ink vary according to the substrate, please verify your substrate in advance. ※2 LF-140 ink set does not include clear ink. You can use a combination with LH-100 clear ink. White ink overlay print enables brighter and far more vivid images on both transparent and colored substrates. 3M Company offers its premium warranty, the 3M™ MCS™ Warranty for the UJV-160 when printing with LF-200 ink and 3M media. This warranty includes up to 5 years weather-proof durability (Warranty periods vary based on type of application, type of media and graphic protection). Please contact 3M in your country for further information. Maximum resolution of 1200 x 1200 dpi and variable dot technology (4 colors / 3 dot sizes) achieve high quality prints. Excellent color reproduction that satisfies all professional requirements, UJV-160 is the machine for enhancing performance and productivity. The UJV-160's printer heater system precisely controls ink dots on film materials, thus creating clear and glossy, high quality prints. The media feeding device enables reliable continuous printing. Just by setting roll media on the device, the media will be transported evenly. Head height can be adjusted from 1.5 to 12.5 mm (stepless), according to thickness of the media. This allows for more precise and high-quality printing on media with various thickness. Media holding plates on both sides prevent warping of the media during printing. This eliminates jamming and achieves more precise and reliable printing. Combination with CF2 series leads to more comprehensive and effective production from printing to cutting.